What incredible projects are you working on or have finished this week? We would love to see them on “Making it thru Monday”! 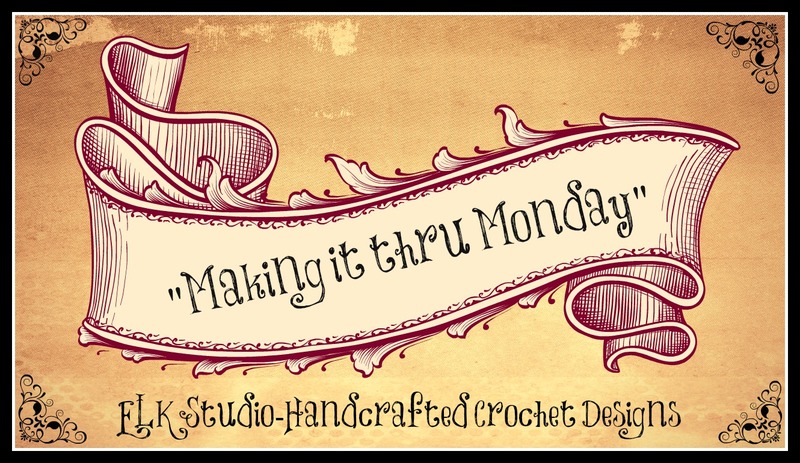 Email your photo at elkstudiocrochet@gmail.com and be sure to tell a little about the project and provide links to the patterns and your blog, Facebook page, etc. You can also upload the pictures directly to my ELK Studio Facebook page. It’s a chance for you to show everyone your wonderful talent! Our top viewed submission is by Jennifer from Stew-art creations. 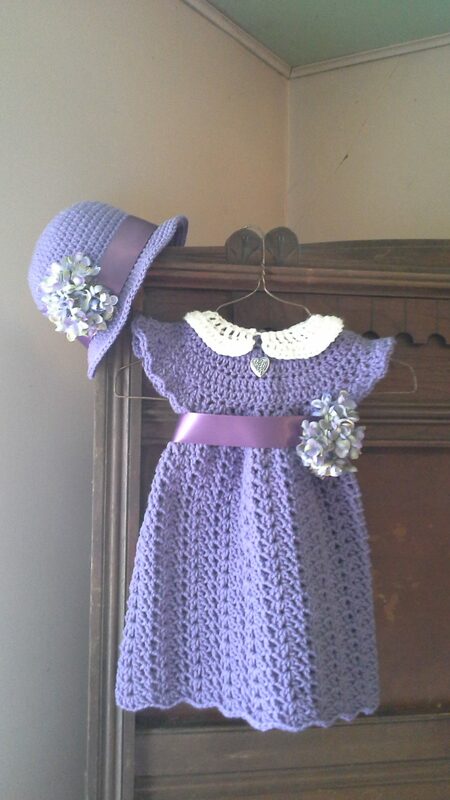 She made this sweet little dress for her God-granddaughter as an Easter dress. It’s the perfect color and the ribbons around them are a nice finish. The hat pattern is Jennifer’s own design. Thank you so much for sharing your talents Jennifer. You always choose the best colors! Here’s the link to the dress on Ravelry. The next submission comes from Carolyn of The Purple Poncho. 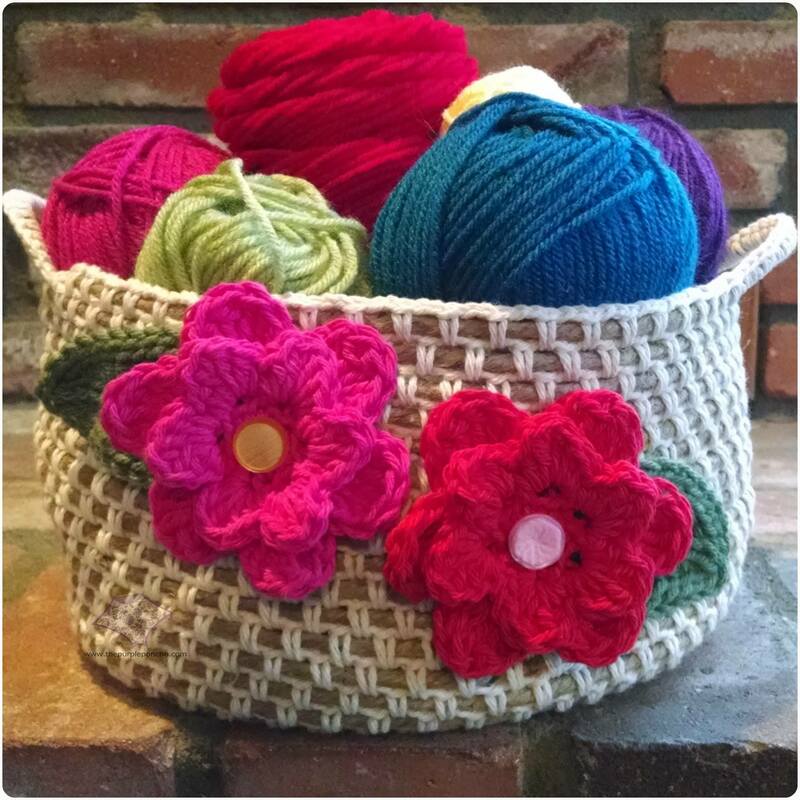 Who doesn’t need a basket for their yarn? She made this beautiful basket with jute which is sure to stay strong and sturdy. I do love the flowers added as decoration too! Thank you for sharing Carolyn! Now go grab your “I’ve Been Featured” button for your blog! After 91 comments on my blog post telling me why the crochet hat should be free, I’m totally convinced in my heart that I’m doing the right thing. I can’t tell you how amazing all of you are! 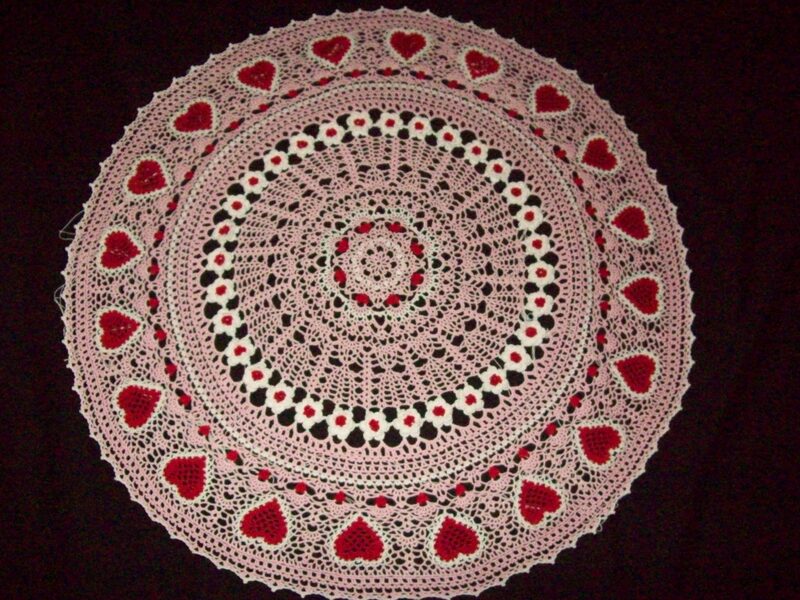 I would imagine if I did the statistics on the comments, 95% of you want the pattern so you can make it to give to someone in need or a loved one. I knew we (crocheters) were generous but it sure is nice to see it comment after comment! I would like to ask for your help. I love designing these patterns and feel honored to share them with you, especially for free. If you are on Ravelry, will you add it to your favorites and place it in your queue? It helps get the pattern out there to everyone which gives it more exposure (potential for more free patterns). If you are on any social media, sharing it would be much obliged too! Some of the information below may seem familiar to you as I used it in Country Appeal beanie. It is still valuable information and applies to this crochet hat pattern also. #1 Key Ingredient – When I created my band, I crocheted 72 rows which made 20” for me. After joining my band on round 1, I made 72 sc around the band. If you need more or less rows to achieve your desired width, that’s okay. Just remember in order for the stitching to come out right, your initial sc round must end on an even number. For example, if it took you 63 rows to achieve 20”, you would need to make sure you had 64 sc around for your first round. Another example would be if it took you 68 rows to achieve 20”, crochet 68 sc around for your first round. Hint: If this is your first experience working with a hat from the bottom up, don’t close the page! You can do this, I promise. It’s much easier than you think and in the end, you might even like it better! Just remember, when you start working the hat, the body may look “too big”. No worries. Once you close the top, it will fit nice and snug just as if you’ve worked it from the top down. 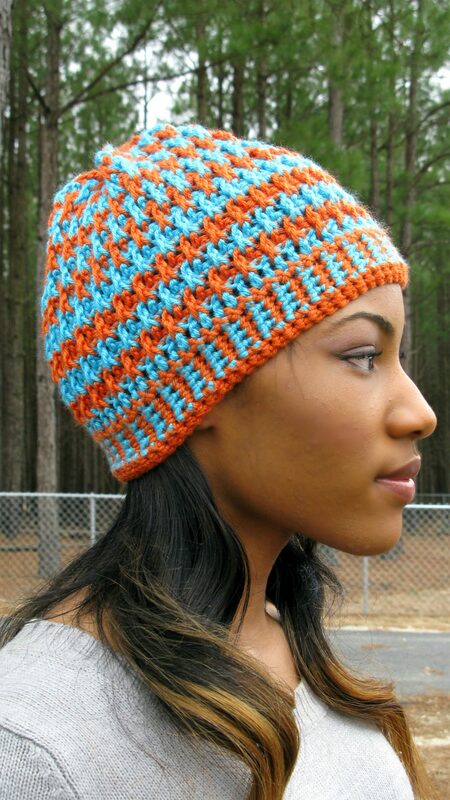 As you can see from the pictures, there are many variations and color schemes you can use to make this great hat. I’m going to tell you how to make all these styles and hopefully not confuse you. Read the pattern instructions first because I want you familiar with it when I start talking to you about the color changes. (I know, I know….. for some of you that might be challenging because you just want to dive into the pattern, but don’t be like your husband and not read the directions first). As for the pattern below, it’s only for a solid color hat. Once you become familiar, you can scroll to the bottom of the page. I’ve got each picture separate with the instructions on what rounds to make your color changes. Trust me, it’s really simple! Don’t miss another FREE pattern. Sign up for my weekly newsletter by clicking HERE! The instructions for this hat, as given, will fit an adult measuring approximately 22”. The hat can easily be adjusted to meet other sizes. When I completed the band, the 72 rows measured approximately 20” and fit perfectly on my model measuring 22”. 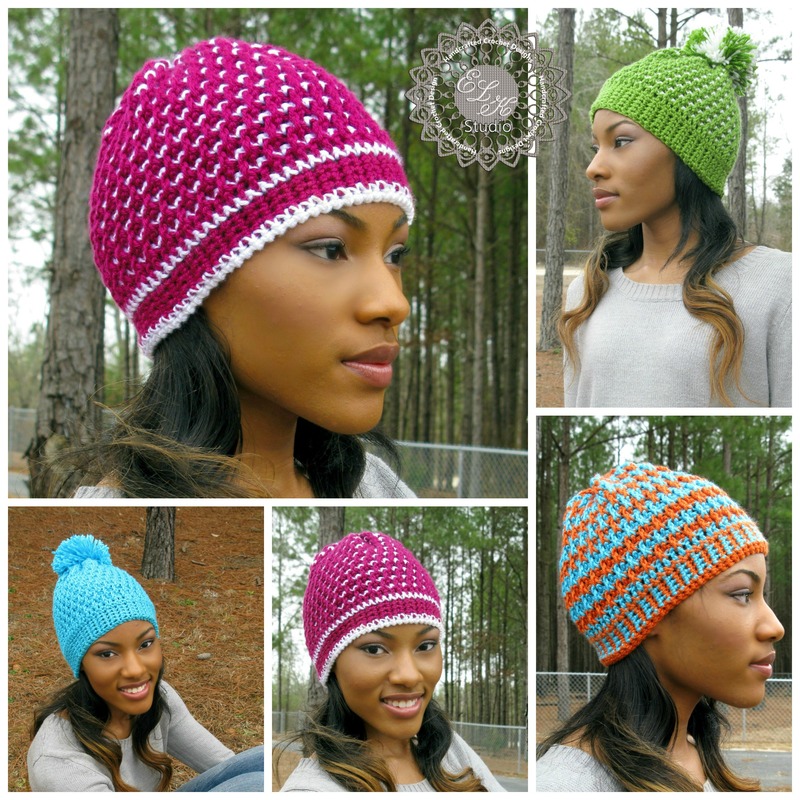 There is a great guide on head measurements provided by Cre8tion Crochet. It will give you the average size of head measurements (including length) from child to adult. I use this reference quite a lot as Lorene does a great job of thoroughly explaining the specifics required to successfully making a hat that fits. Round 6: Sl st in next sc, ch 3, skip next sc and fpdc in round below skipped sc , *dc in next sc, skip next sc and fpdc in round below skipped sc*, sl st to top of 3rd ch. Round 8 – 22: Repeat Rounds 6 & 7 or until you have reached your desired length. On this hat, you can see white is the “background” color. To get this look, on each round (not rows which is the band) that instructs you to sc, use white. So what that means is all your odd # rows are white. For this hat, the band is also multi-colored. Change your color for each row, carrying your yarn along with you. I have shown you how to do this in my Houndstooth Scarf pattern with some photos, so this will help you if you don’t understand how to carry the yarn. Once you finish the band, you will follow the same instructions as above on the raspberry/white hat. If you want to make a pom-pom for the top of your hat, The Crochet Geek has a wonderful video to show you how. As always, please don’t use my photos as your own. You may sell your finished product from my pattern. If you share my pattern on any social media, please link back to my blog. If you print out that pattern, please leave my header on the page. I hope you enjoy the pattern. Have a great day and be blessed! What incredible projects are you working on or have finished this week? We would love to see them! Email your photo at elkstudiocrochet@gmail.com and be sure to tell a little about the project and provide links to the patterns and your blog, Facebook page, etc. You can also upload the pictures directly to my ELK Studio Facebook page. It’s a chance for you to show everyone your wonderful talent! The top viewed project from last week comes Arlette of Tying Knots. She does some of the most beautiful thread work I’ve ever seen. Her doilies are always elegant and beautifully made. Her latest project is just in time to celebrate Valentine’s Day! Have you ever seen anything as lovely? Thank you for sharing your talents with us Arlette! 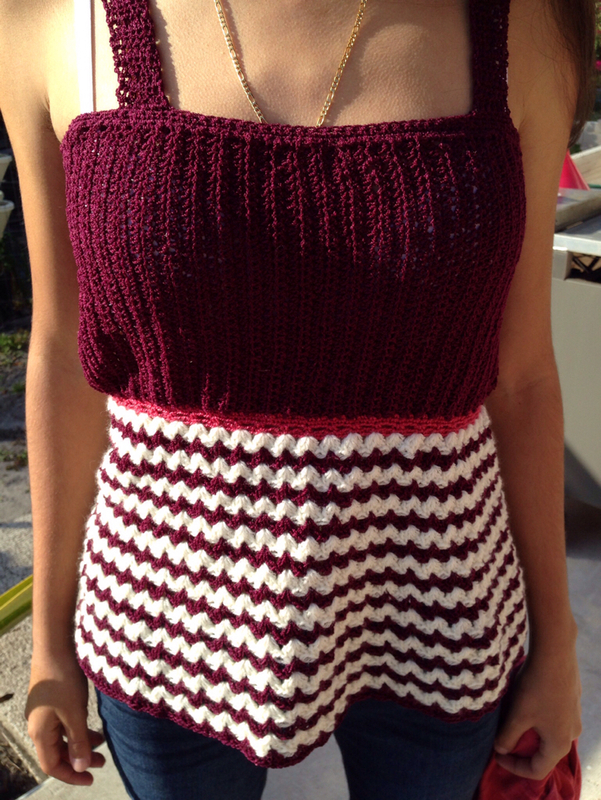 Our next project comes from Ananicole and her beautiful crocheted tank top. She designed the pattern herself. Her daughter is so lucky because she seems to receive all these wonderful projects her mom makes! I love the color and stitching of your garment Ananicole. You are so talented, and I appreciate you sharing your work with all of us!